Anthologies are like woodcock. They flight in with the arrival of the mists of autumn and are gone by March. So it is all the more surprising when one arrives just as its kin are being laid out in serried rows on the dealer’s shelves, and shocking when it turns out to be as good as this. 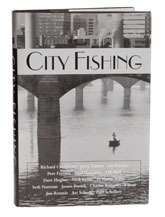 City Fishing is a highly original idea, yet so obvious that I wonder why no-one has ever thought of it before. 188 pages brings you seventeen stories, eight of which have never seen the light of day before. The remainder come from sources as airy as The New Yorker, or as earthy as Fly Rod and Reel. In here is some very fine writing. My favourite is Richard Chiappone’s The Chubs, which to my mind is the stuff of which prizes are made; but every one of the stories is strong enough to stand up on its hind legs and I could get seriously enthusiastic about Bright Fish, Nice City, while Pete Fromm’s Through the Ice is an extraordinarily well recounted tale. And… but you had better read it yourself. If I have one criticism, it is that the stories are mostly set in North America (the three exceptions being Paris, London and Tokyo) – which means that there is an opportunity for a second, more international volume. My advice to Stackpole is that they get Judith Schnell, who sourced and edited this small masterpiece, to get working on it right away.